Who doesn't love pot pie ? And even better that you can make this in the crock pot ? I think pot pies were ten cents when I was a kid...am I showing my age ? And we used to carve our initials in the tops before we put them in the oven, so we knew which was which. Silly, right ? But, I still love the flavor. So, the goal here is to replicate the flavor, with the ease of a crock pot dish. 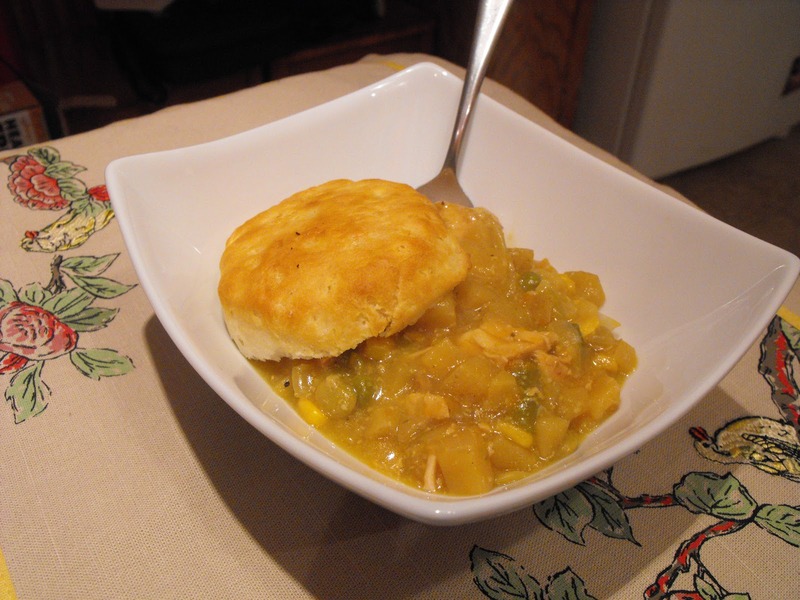 I made biscuits, but you could easily make a quick crust and crumble over the top, and really have pot pie. Pour over mixture in crockpot, and start on low. Heat on low for 8-10 hours until cooked through. In the meantime, you can make biscuits, or make a quick pie crust for garnish. Serve over biscuits, or crumble pie crusts over the top.